Political and epistemological battles between a group of Russian official, or academic scientists and a group of Russian entrepreneurial, or folk scholars continue. Since the publication of a “resolution” denouncing Anatole Klyosov’s DNA Genealogy as pseudoscience (extensively covered on this blog here and here) the conflict has not abated (as academic scientists probably hoped) but exacerbated. A couple of recent highlights. 1.Elena A. Mironova (Елена Миронова, an academically-trained philologist and professor of Rostov State School of Economics who joined the ranks of folk scholars, entered one Trinitarian Academy, co-authored a number of papers with Klyosov and was therefore punished by the academic world with a profile in Freakipedia) filed a complaint with Rector of the Russian State School of Humanities (RSSH), Efim Pivovar (Ефим Пивовар), cc-ing Minister of Science and Education Dmitry Livanov (Дмитрий Ливанов). 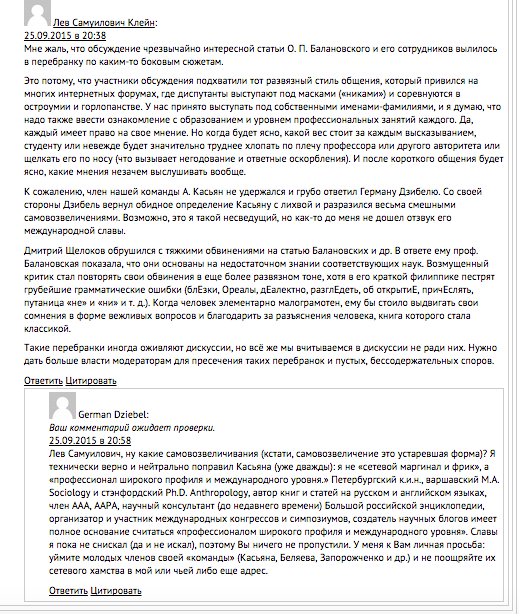 In it, she accused а RSSH professor, Dmitry Beliaev (Дмитрий Беляев), an unrivaled young Russian specialist in Mayan hieroglyphics, of the embezzlement of grant funds. According to Mironova, Beliaev spent grant money on rehashing Western literature on the subject (which is understandable considering that Beliaev was born in Tula, is based in Moscow but his scholarly dreams have transported him to Central America) without contributing anything new to the problem. 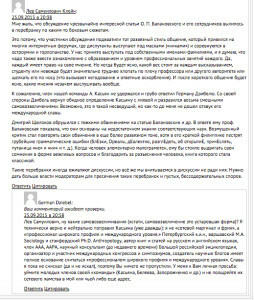 Beliaev responded to the accusation on his weblog “Maoist” with a bold, sarcastic post that drew two comment pages worth of cheering, chuckling and giggling from a horde of mostly anonymous fans of Russian academics as well as from Beliaev’s buddies and good reposters such as Hittologist, xenophobe and freak-hunter, Alexei Kassian (Алексей Касьян). It remains unclear if there is indeed anything new and substantive in Beliaev’s writings on Mayan hieroglyphics and whether the allocation of grant funds to Mironova’s project on seeking scientific explanations for ancient look-alike ceramics across the world would have been a smarter decision. On the one hand, if Beliaev serves as a mouthpiece for Western Mayanists in Russia by day (and a vocal watchdog for pseudoscientists by night), Western Mayanists, but not Russian funding agencies, should foot Beliaev’s bills. On the other hand, not every remarkable ceramic phenomenon observed all over the world should be given a state-sponsored scientific explanation. So, the contested cash should probably have stayed with the funding agency. For illustration purposes, here’s a screengrab of my last blocked comment that came on the heels of Klein’s comment. I hereby announce the onset of Western sanctions intended to curb corruption, cyberbullying, hate, double standards, bickering and ad hominem attacks routinely employed by Russian folk and academic scientists. In line with these sanctions, website генофонд.рф is now blacklisted as a web property that encourages hate, cyberbullying and pseudoscience and that suppresses freedom of speech. Oleg Balanovsky’s mother is sanctioned for public lying and selective apologizing. Alexei Kassian and Valery Zaporozhchenko are sanctioned for persistent hate, double standards, bickering, disrespect, self-aggrandizement, ad hominem attacks, ignorance, xenophobia and pseudoscientific statements. Leo Klein is issued a gentle warning for misplaced, biased and hifalutin rhetoric. The sanctions are in place for a month.